An “Umbrella” or “cover” school will approve and oversee a homeschool program. They may offer distance learning that can be used for one subject or as a complete curriculum. Some provide the learning materials while others work with the parents to find curriculum choices that are the best fit for the family. 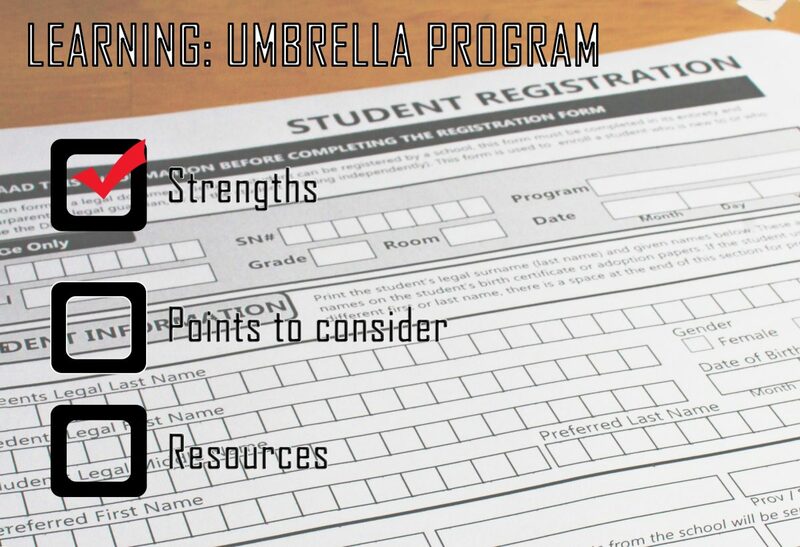 There are umbrella programs that offer courses that are similar to what is offered in a public school and others that follow an alternative educational style. Some offer accreditation while others do not. A typical homeschool day under an umbrella program is often like a traditional school day, but that depends on the educational style of the program. Usually the school will keep a record of students’ marks. Sometimes field trips or other activities are organized through an umbrella school as well.